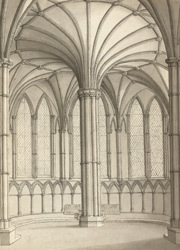 A view in ink of the interior of the chapterhouse at Lincoln Cathedral. Built in the early 13th century, the chapterhouse is one of the most ambitious buildings in the cathedral complex. It is a large polygonal chamber with a single central pier supporting the vault. Around the interior walls are a series of arcaded niches and a stone bench for clerics. Chapterhouses occur uniquely in Britain, and were the site of the most important clerical business of the day.